Because organizations today cannot afford to invest in solutions that don’t drive performance and business results, we take the steps necessary to ensure we recommend a solution that fits your needs. We are often contacted by potential customers who request a training solution because they think it will solve their performance issues. Because of our expertise in the performance system, we know that training may not be the right solution. In fact, it is typically the sole solution to overcome performance challenges less than 15% of the time. While it may be part of the solution, it rarely stands alone. This is precisely why we focus on the entire performance system to uncover what environmental and individual factors may be limiting performance. Just like a wheel requires the correct balance and alignment in order to operate most effectively, so does the performance system. 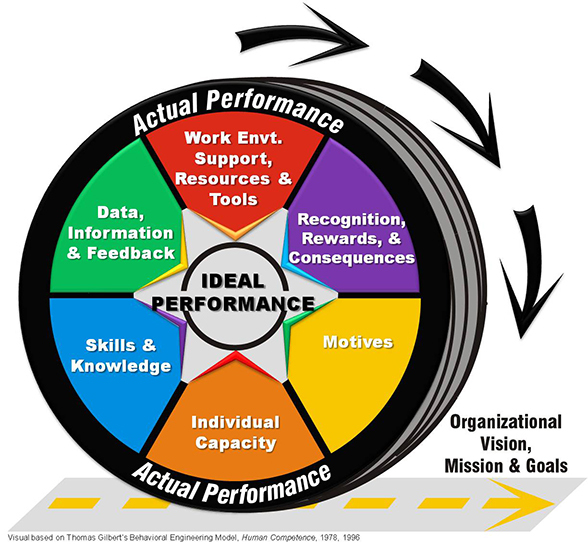 There are various environmental and individual factors that when properly balanced help to achieve optimal performance. When any one factor is out of balance, the performance and business resluts acheived are less than optimal.